According to mythology Sicily’s underworld was inhabited by Hephaestus, the god of fire and his team of giants responsible for creating the weapons of the gods. The ancient Greeks attributed the volcano‘s rumblings to the noise of the underground anvil and forge, while eruptions from Mount Etna were believed to be sparks from Hephaestus‘ furnace. Traditionally, there are four types of volcanic explosion: Plinian Hawaiian, Strombolian and Vulcanian. 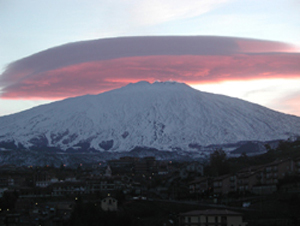 The last two types take their names from the volcanoes on the Aeolian Island where the phenomena were first observed. The Strombolian phenomenon, peculiar to the volcano on Stromboli, is characterised by phases of persistent, moderate explosions followed by intermittent periods of idleness. Such eruptions caused by a large build – up of gas being suddenly released like a pressure cooker, have been known to project tall fountains of lava attaining in some cases several hundred metres. Vulcanian eruptions, as first observed on the island of Vulcano in 1888, result in outpourings of lava and pyroclastics (solid fragments supended in clouds of dense ga reaching exceptionally high temperatures) which pour down the sides of the volcano at speed of up to 300 m per second. This phenomenon is also described as hydrovolcanic because the highly explosive effect is caused by an interaction of molten magma with trapped water deep of molten magma with trapped water deep within the earth’s crust.